Ioana Stoian is a young British- born artist with a passion for paper. Her love for hands-on arts and crafts led to a trip to Japan in 2006, where she discovered the world of papermaking and paper folding - two interests she continues to explore today. Fascinated by this medium, she has spent time in America and in Japan studying and working with master papermakers. Ioana is a member of the IAPMA (International Association of Hand Papermakers and Paper Artists) and frequently participates in the global origami community. She hopes this book brings you the same joy she received when first discovering the art of origami. 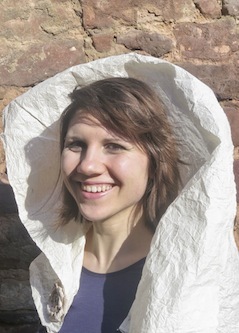 You can find out more about Ioana and her love of paper on her website at www.ioanastoian.com.